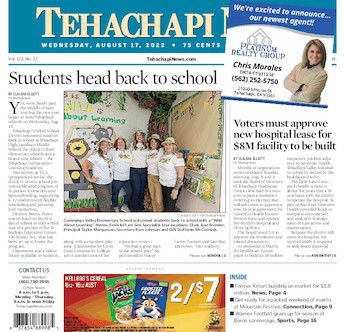 The Tehachapi News office is at 411 N. Mill St. Volunteers, from left, Pat Doody, Zanya Biviano and Michelle Vance welcomed both residents and visitors alike to a Visitor Center anniversary celebration. Visitors stop at the Tehachapi Visitor Center, which was a stop during a downtown wine tasting event. The Kern County Library Tehachapi branch's new location is 212 S. Green St.
Thursday - Monday, 10 a.m. to 4 p.m.
Monday - Friday, 10 a.m. to 4 p.m. Closed from 1 to 2 p.m. for lunch. Friday - Sunday, noon to 4 p.m. Monthly meetings on the first Wednesday of every month at Slice of Life Enrichment School, 48771 W. Valley Blvd.